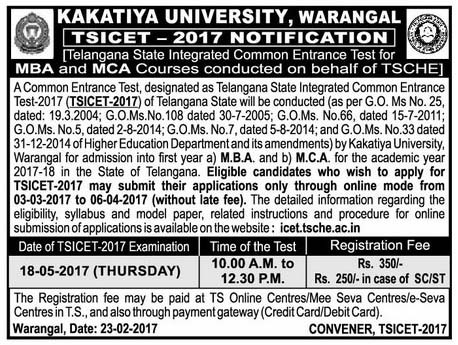 TS ICET 2017 Notification, Last date, Integrated common entrance Test 2017 is conducting by Telangana Sate. ICET 2017 is conducting for admissions into M.B.A. and M.C.A. courses (full time/part-time/evening/distance mode) for the academic year 2017-18 in Telangana. MBA: The candidate Should have passed recognized Bachelors Degree Examination of minimum three years duration with at least 50% marks (45% marks in case of reserved categories) in the qualifying examination. MCA: The candidate should have passed recognized Bachelors Degree examination of minimum three years duration with at least 50% marks (45% marks in case of reserved categories) in the qualifying examination with Mathematics at 10+2 level.